This is a brochure for the now rarely seen Vauxhall Belmont. This is a GM Bodystylers accessories brochure issued by Vauxhall Motors Ltd. It is in the described condition. Vauxhall Nova, Astra MK2 & Cavalier MK2. 4 page folder. Number of pages Models covered. Publication Number V6305. Original Sales Brochure for the Vauxhall Belmont. This includes the Belmont 1300, 1600, 1600D L, 1300, 1600 GL, 1600 GLS and 1800i GLSi models. Dated December 1985. 28 page, well illustrated, colour booklet. This is a brochure for the Vauxhall Nova, Astra, Belmont & Cavalier cars for Disabled People and issued by Vauxhall-Opel Passenger Car Marketing. It is in the described condition. Vauxhall Nova, Astra, Belmont & Cavalier. Dated October 1985 and covers 1985-1986 models. 8 page folder, well illustrated, English text. Manta Coupe & Hatch - GT, Berlinetta, GTE. Astra Hatch & Estate - Base, L, GL, SR, GTE. Monza GSE Coupe 3.0i. Cavalier Saloon, Hatch & Estate - Base, L, GL, GLi, GLS, GLSi, SRi, CD. VAUXHALL-OPEL RANGE Sales Brochure. Undated but c early 1985 and covers 1985-1986 models. Double-sided single sheet, well illustrated, English text. Manta - GT, Berlinetta, GTE. 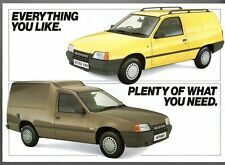 VAUXHALL-OPEL Colours & Trims Brochure. 1987 Edition No.1. I HAVE A HUGE COLLECTION OF ALMOST 5000 AUTOSPORT MAGAZINES RANGING FROM 1950s TO 2007. NOVA / ASTRA / CAVALIER / MANTA / CARLTON / SENATOR / MONZA inc GSE. VAUXHALL OPEL RANGE BROCHURE. 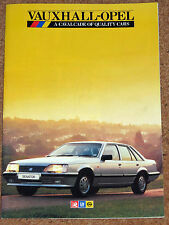 24 page COLOUR BROCHURE - OCTOBER 1985, UK - 198 6 MODEL YEAR. Lots lots more to be added in the coming weeks and months. Dated November 1985 and covers late 1985-early 1986 models. 10 page booklet, well illustrated, English text. 32 page booklet, well illustrated, English text. Very good condition; light crease to upper right corner of front cover, very light rubbing to white covers. This is a full GM Bodystylers accessories brochure issued by Vauxhall Motors Ltd. It is in the described condition. Vauxhall Nova, Astra, Belmont, Cavalier & Carlton. B& W or Colour Number of pages. VAUXHALL-OPEL GMS BODYSTYLING Sales Brochure. Other Models - Astra Mk1, Chevette, Cavalier Mk1, Manta. Dated September 1987. I HAVE A HUGE COLLECTION OF ALMOST 5000 AUTOSPORT MAGAZINES RANGING FROM 1950s TO 2007. Dated October 1985 and covers 1985-1986 models. 24 page booklet, well illustrated, English text. Dated August 1985 and covers 1985-1986 models. 4 page folder, well illustrated, English text. Covers NOVA inc SR / ASTRA inc GTE / CAVALIER / MANTA / CARLTON / SENATOR / MONZA. VAUXHALL OPEL ALL MODEL CATALOGUE - DECEMBER 1985 - FEBRUARY 1986 EDITION. 128 page COLOUR BROCHURE - NOVEMBER 1985, UK. Undated but c 1986 and covers 1986-1988 models. 4 page folder, well illustrated, English text. This is an Original Irmscher UK Press Photo of the Vauxhall Belmont Saloon. The photo shows a Belmont Saloon with the then new Twin Headlamp conversion, full bodykit of front & rear bumpers, alloys etc. Manta GT, Berlinetta, GTE. Original UK market Sales Brochure for Colours and Trims for the Vauxhall Opel range. Astra Base, L, GL, SR, GTE. Cavalier Base, L, GL, GLS, SRi, CD. Publication Number V6248, dated September-November 1985. Dated July 1985 and covers 1985-1986 models. 6 page folder, illustrated, English text. Engine technology by FEBI Bilstein — for smooth driving. Product type : Camshaft CAMSHAFT. ManufacturerFebi Bilstein. Modern engines are precision assemblies - just like each individual spare part. Lambda Sensors. 1988 edition no 3, dated April 1988 and covers mid 1988 models. 140 page booklet, well illustrated, English text. GMS Body Stylers - GMD6090 - JUNE 1986. Vehicle Alarms - GMD6065 - APRIL 1986. MANTA HATCHBACK - 1.8 GT, 1.8 Berlinetta, 2.0i GTE. MANTA COUPE - 2.0i GTE. VAUXHALL - OPEL MOTOR SHOW Sales Brochure. CAVALIER - Base, L, GL, GLi, GLSi, 1.8i SRi, 2.0i SRi, 2.0i CD. Dated October 1986. 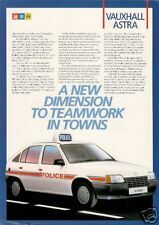 This is a Vauxhall - Opel Colour & Trims brochure 1987 Edition No2 issued by Vauxhall Motors Ltd. It is in excellent condition. B & W or Colour Vauxhall-Opel all models. Models covered 10.75ins x 5.25ins Portrait.